National Signing Day: Here’s who we have so far …. Above: Last year’s football photo at the Rose Bowl. Here’s who we have so far. We want to have a group photo that’ll run in Thursday’s paper. If you are on this list please come to the Star-News at 2:30 p.m. on Wednesday wearing a sweater/shirt of your school. If you are signing to a Division I school on Wednesday and you are not on this list, e-mail me at miguel.melendez@sgvn.com for details. Boys Basketball: No. 2 Pasadena beats Burroughs, 56-34, to improve to 9-1 in the Pacific League; No. 1 Muir beats Hoover, 55-33, to improve to 10-0 in league. Muir’s Andre Frazier scored 12 points and grabbed seven rebounds. Maurice Ballard scored 12 points and dished out six assists and Deron Wilson had 11 points as the Mustangs cruised to the win. Muir improves to 21-1 overall. PHS improves to 16-6 overall. Boys Basketball: Keppel’s Matt Low scores 30 points as the Aztecs nail 12 3-pointers to beat rival Alhambra, 62-49, on Friday night. ALHAMBRA — The forecast may have indicated clear skies on Friday night, but it was raining 3s inside Alhambra High School’s gym. Keppel’s Matt Low hit five 3-pointers en route to a game-high 30 points as the Aztecs buried Alhambra for a 62-49 Almont League win. Keppel (15-8, 5-1) hit 12 of 20 3-pointers and Alhambra (9-11, 2-3) never came close to matching the Aztecs’ efficient shooting from the perimeter, much less defending it. Keppel had open looks, and it gradually got better for the Aztecs, to the point that Low and Garrett Masada, who hit four 3-pointers to finish with 16 points, made the extra effort for step-back jumpers from beyond the arc. “What we try to do is if we find a hot guy we try to run more sets for him and isolate him,” Keppel coach Hung Duong said. It’s the third straight game Keppel has hit at least 10 3-pointers, and to no one’s surprise has won in convincing fashion. The Aztecs shot 6 of 10 from the 3-point line in the first half. Alhambra’s Miles Ford scored a team-high 14 points and Aaron Cosme, who played for the first time after missing two games because of a head injury, added nine points. The Moors not only struggled matching Keppel from the 3-point line they also couldn’t establish a post presence dispite several mismatches, and with it the game slipped away. “They just beat us physically to the spots,” Blanchard said. “We had a hard time executing our offense that way. When we started attempting to match them with outside shots it was out of frustration, guys not getting into open spots and instead forcing shots. Keppel took a 35-23 at the half and led by as much as 53-31 on Adam Thompson converted a free throw with 25.5 seconds left in the third quarter. In that quarter, Alhambra converted 2 of 6 three-point attempts from Kevin La and Cosme, who hit it as time expired. The Moors finished 4 of 16 from the 3-point line. Keppel’s success running the floor and its full-court press was too much for Alhambra to handle as fatigue clearly set it late in the third quarter.The Moors at one stretch missed four consecutive layups on two possessions with under a minute left in the third quarter. And Alhambra still struggled defending the 3-point play as Low twice was fouled behind the 3-point line. Much to Duong’s chagrin, Low only hit one-of-6 free throws. Still, the chess game was set, and Keppel took Alhambra out of its element. 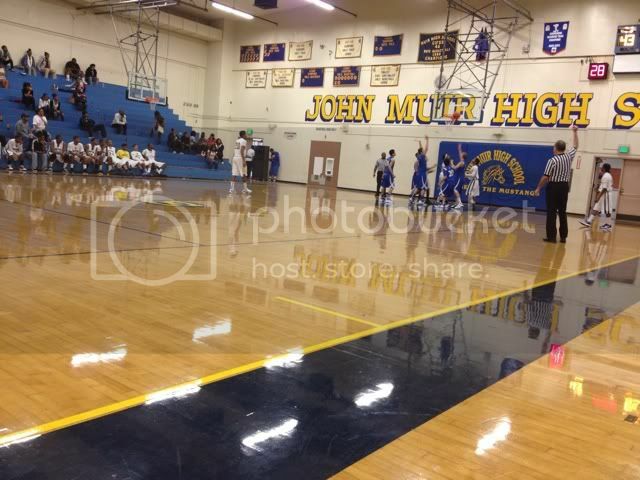 Boys Basketball: Muir overcomes sloppy play, beats Burbank, 54-42, to remain unbeaten in Pacific League. Pasadena improves to 8-1 in league with 49-35 win over Glendale. PASADENA — It’s becoming clear the longer the Muir High School boys basketball team remains undefeated in the Pacific League the more difficult it’ll become to keep it that way. No surprise they’ve become the new team to beat, the Mustangswere given a formidable challenge by Burbank, which led by four in the third quarter before Muir reverted back to its style, swarming the visiting Bulldogs with a relentless defense that resulted in a 54-42 win Wednesday night. Muir (20-1, 9-0) can’t simply count on its talent and unparalleled speed to keep it atop the league standings, and the Mustangs got a crash course of that against Burbank (11-11, 3-6), which also led by four at the half against Pasadena earlier this week before losing. That Muir had finals earlier in the day isn’t an excuse, but the early-school release meant the Mustangs had a long break before tipoff. Muir got off to a solid start, quickly building a 9-0 lead and its defense limiting Burbank to 0 for 6 shooting on its first eight possessions while forcing them to commit four turnovers. Dion Nelson’s 3-pointer off a Bulldogs turnover made it 16-2 with 1:48 left in the game. Alex Voskanian scored the only points for Burbank, on a putback to make it 9-2 and two three-pointers in the final minute. Burbank shot 3 of 14 in the first quarter. Muir’s Brian Carrier and Nelson scored the only points in the second quarter while the Mustangs were burned with dribble penetration and kick-outs. Burbank took the lead on a Voskanian 3-pointer with 2:39 left in the third quarter to make it 31-28. Caine Brown’s layup made it 33-28 and the Bulldogs led, 36-34 heading into the fourth quarter. Muir went into a zone late in the third quarter but it went into full effect in the fourth quarter. Burbank found it tough adjusting to the zone, committing seven turnovers in the fourth, four of which came inthe first minute that saw no shot attempts from the Bulldogs. Jelani Mitchell, who finished with 13 points and four steals, stole the inbounds pass on the opening play in the fourth and tied it with a fastbreak layup, 36-36. On the ensuing play, it was Tevin Polk making a steal. He scored in similar fashion to make it 38-36, a lead the Mustangs would only add to. Burbank’s Brown on the next play was called for a foul trying to position himself against Polk. Brown’s frustration was evident as he pushed Polk from behind to give Muir possession. Brown fouled out with 3:45 in the fourth quarter and the Bulldogs suddenly went away from driving in, looking for the outside shot that never came. Andre Frazier played a big hand in forcing Burbank outside. He became a force in the middle and finished with five blocks along with eight points. on Monday, finishing with 12 points. Basketball: For the first time in at least four years, there’s a new No. 1 boys team in the Star-News area. Showed heart vs. Village Chr.